That’s her, the tiniest and mightiest ruler in the house is our little almost 10 pound cat named Bella. I will tell you she is just a true little diva, because what Bella asks for she gets. Our heart melted 2 years ago when we discovered her and rescued her. I had no idea the life a kitty could bring into a house and the love that a little 1 foot animal had to share. The holidays are a time to give gifts, and gifting is not just for your kids, it is also for your other kid(s) the family pet! 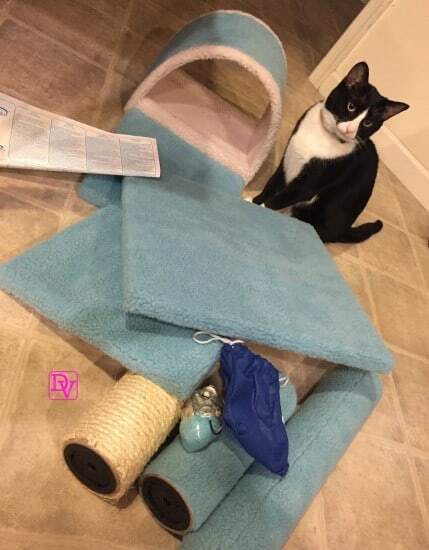 Holiday gifting for your cat has to be special, and if you are like us, they are a member of your family, a brother, a sister, a daughter, etc. People that don’t have pets don’t get us, but if you have a cat, a kitty, cats, you know that holiday gifting for your cat is a must! We love finding toys, items and things that make Bella even more of a little character than she already is. 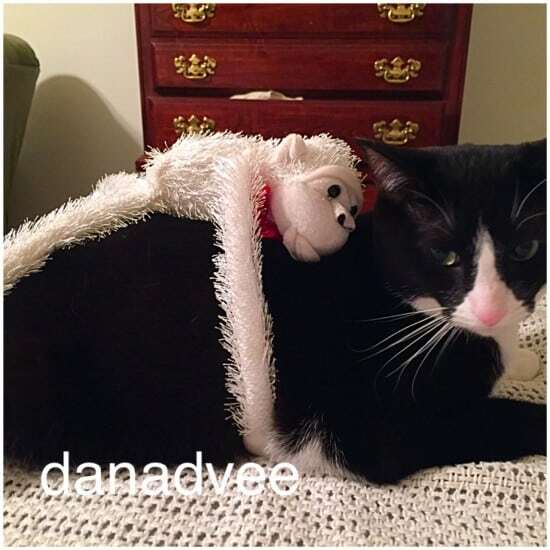 Here is my story of holiday gifting for your cat as I lavishly live the holidays out loud! So, Bella loves to interact with toys, like milk rings, play mice, little toy balls, and things that hang and Bella has this little friend outside that visits her everyday, it is a chipmunk. While I am sure that she would not be so kind to it if she were outside, the chipmunk comes to sit with her everyday. He backs up and she sits forward and they sit like this for about an hour a day without fail. Sitting at the window tending to the outside world is truly a big job and it takes a mighty cat and a great seating arrangement to handle this! 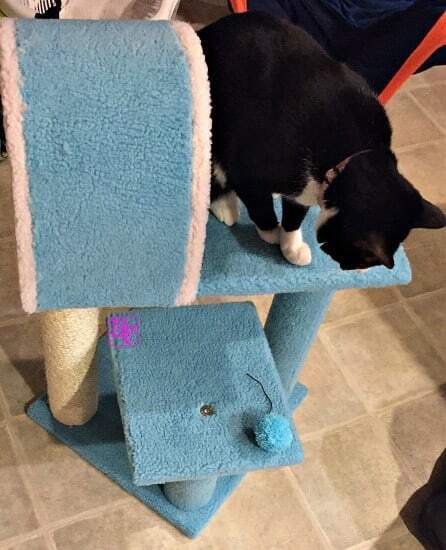 Bella is super excited with her new holiday gift from Chewy.Com because she can choose from 3 level seating, smack a pom-pom around and of course scratch and scratch, this is her new Aramark Cat Tree with the lovely color of Sky Blue! Let me tell you the queen diva sat over the contents of the box and did not move for one hour until we could build it. She stared us down and took complete possession, have a look. Once we had a second, my husband and I sat down and built her tree. It took us about 10 minutes and Bella never left our side, as if we were going to take ownership of it, silly little tuxedo cat! 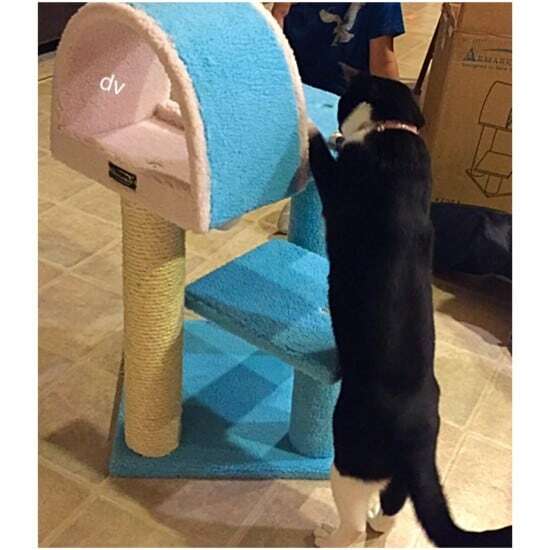 Want to know the dimensions of this Aramark Cat Tree? Overall Dimensions: 25 x 25 x 30 inches with Base Dimensions: 16 x 16 inches and House Dimensions: 12 x 8 x 10 inches. The Perch Dimensions: 12 x 10 inches. The maximum holding weight on this is, 20 lbs These are very well apportioned for our cat. The whole tree is sturdy, trust me, we have had a few and many are junk, this one is nice and solid and will take the playfulness that is about to be unleashed! Now the tree is built and it is the moment we all have been waiting for, would Bella just go to it and play or would it take coaxing? Well, we threw her favorite milk ring to it and up she went and the rest is playtime history, have a look. Bella has been quite happy in fact she is jumping, standing, scratching and playing on it non-stop, great new toy and piece of furniture for our little Bella! Product provided by PR Firm, images, and story are my own, and of course Bella’s!